VH1 Classic has acquired the rights to the classic animated comedy Rocky and His Friends. 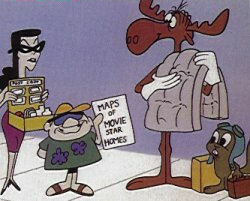 It originally aired on ABC from 1959-61 known as Rocky and His Friends and then as The Bullwinkle Show for the remainder of its run on NBC from 1961-64. The series will begin tomorrow with a Thanksgiving marathon from 11am-7pm. The series will join live action comedies Married...with Children and The Larry Sanders Show on the late night line-up. Rocky and His Friends will air three nights a week Sun-Tues (early Mon-Wed) at 1am following The Larry Sanders Show at 12:30am (which is five days a week, Sun-Thurs) in its new time period. Married...with Children will move to Sun-Thurs at 11:30pm & 12am, so a half-hour earlier. The sitcom will also remain weekdays 6-7pm. Rocky and His Friends is the animated antics of flying squirrel Rocket J. Squirrel, or Rocky, and his dim companion, Bullwinkle J. Moose. And let's not forget the two spies who always complicate things for our heroes: Boris Badenov and Natasha Fatale. 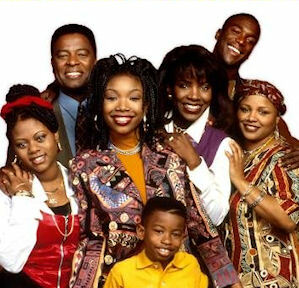 BET will be sharing the comedy Moesha with sister network Centric beginning next week! Centric has been airing the series since October, airing it weekdays from 2-3pm ET. Moesha will actually get a marathon on BET on Thanksgiving Day from 8am-3pm and an overnight marathon on Sunday, Nov. 25 from 11:30am-8am leading into its new regular time period on BET beginning Monday, Nov. 26. BET will air the Brandy sitcom weekdays from 8-9am ET, cutting back an hour of Everybody Hates Chris, which will remain airing 9-10am. No other schedule changes will be made on BET, as My Wife & Kids, The Jamie Foxx Show, and The Parkers remain in their time periods from 10am-4pm. BET will also showcase Thanksgiving weekend marathons of The Parkers and The Steve Harvey Show on Friday and Saturday. Moesha will get another marathon on Saturday, Dec. 15 from 10am-5pm. Stay with us for any more news on BET and Centric.